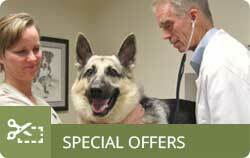 Always treated wonderfully at Doylestown Veterinary Hospital. They are always so sweet to my old ‘fraidy” dog, and the staff is informative, helpful and respectful. Everything is explained and there are no surprises. Now if I could just find a human practice just as good. Dr. MacDonald was really great, and the veterinary tech who worked with him during Ruby’s visit was so comforting. It’s been a long time since I had a new puppy, so Dr. MacDonald explained everything I needed to know about Ruby and her puppy care! We like your practice, and the receptionists are always helpful. have been very happy with the care my dogs have received since Drs Randy and Laura Weis acquired Dr. Hopkins practice. Zip and Zoe usually see Dr. Palin who is very patient, kind and caring. She has helped with various problems and always takes time to answer my questions. 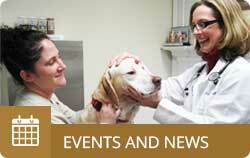 Zoe has seen Dr. Erk for acupuncture and recently saw Dr. MacDonald. They too are very caring doctors, always taking time to explain the situation and the treatment. Zoe loves your biscuits and their convenient locations around the practice! When we transferred here from California in 2009 I did a great deal of research to find the very best veterinary establishment for my boys, Henry and William. 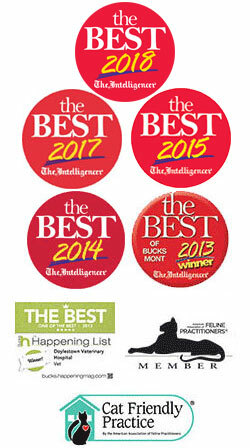 The results of my research lead us to Doylestown Veterinary Hospital. Then we adopted a little sister for the boys, named Mary Stuart (“Stuie”) and she also goes to DVH. Your doctors and the staff are superb; genuinely caring, personable and great to know! Further, they are excellent at educating we “parents”. I give DVH an A+++ and have recommended them to many pet parents. Thank you for the comfort and care you provide. My dogs (Bean, Kerry Blue Terrier and Caber, Rottweiler) and I really enjoy coming to your hospital. I particularly love the blend of conventional and holistic practices as I lead a holistic lifestyle. I’ve already referred a few friends for acupuncture with Dr. MacDonald! We’ve been coming here for 10 years…and it’s the only place I will go. There are not enough good things I can say about this practice. Probably the best thing, from a dog’s perspective, is that Fred always walked in the door wagging his tail. The staff is a super team of folks to work with. As a diverse and highly skilled group, they meet the definition of a true hospital. They are truly wonderful and dedicated people. We consider them a part of our family. The staff was extremely professional and accomodating to my needs. Everyone was friendly and reassuring during my visit. My pet was treated with dignity and respect even though she was quite fiesty. DeMille is seven years old and we’ve been coming to DVH since he was a kitten. They’ve always been kind to him…especially two years ago when he was treated for a urinary blockage and had to stay at the hospital for several days. 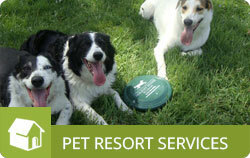 I am telling you, this is the best place to bring your dog! Everyone here is phenomenal. Shamus loves it here. I cannot express enough how wonderful Dr. Palin has been to my dogs and me. Dr. Palin was so kind and compassionate with our Max. You can see the love and care she has for animals, as well as their humans. The entire staff is wonderful and supportive. 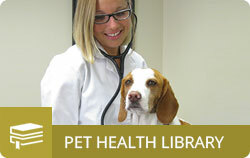 The staff is able to help even very nervous pets become comfortable, and the level of care is exceptional.